Matt Hilton worked for twenty-two years in private security and the police force in Cumbria. He is a 4th Dan blackbelt and coach in Ju-Jitsu. He lives in Cumbria with his wife and son. His series featuring Joe Hunter has an army of fans on both sides of the Atlantic. Matt tells us more on Joe Hunter. 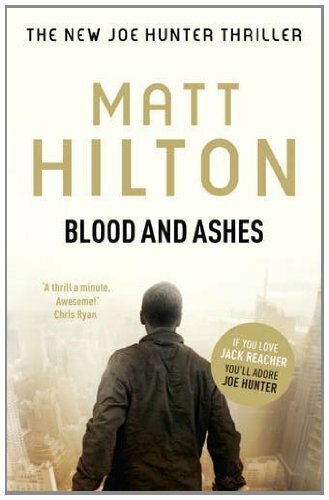 Blood and Ashes is the fifth in my on-going series of crime thrillers featuring Joe Hunter, an ex Spec Ops soldier who is adrift in the world, with a particular set of skills that he employs to help those who are unable to help themselves. Sometimes Joe comes across as a little uncompromising when dealing with the bad guys, but he is a man of two halves who also cares deeply for those he chooses to protect. The tag line for the series reads: “Some may call me a vigilante. I just think I’ve problems to fix”. Because the books centre on a tough guy, action figure, comparisons are often made between Joe Hunter and Lee Child’s Jack Reacher, Robert Crais’ Joe Pike or the heroes featured in the military thrillers of Andy McNab and Chris Ryan. I’m very happy to be mentioned alongside all these greats – who wouldn’t be? –and I am a fan of them all. However, I’d like to put to bed a slight misconception about whom my influences are and what I have been aiming to achieve with the Joe Hunter series. I’ve been writing pretty much as long as I can remember, and even as a small child was penning action based short stories, drawing my own comic book strips, or plotting story boards for the movies I’d make one day – an unresolved fantasy. Alongside this I was an avid reader, drawn to fast moving, exciting plots where it wasn’t necessarily ‘who done it?’ that was as important as ‘How the hell are we going to get out of this?’ that held my attention. It therefore stood to reason that I’d write in a similar vein. I grew up on the pulp fiction masters, and was a particular fan of Robert E Howard (Conan the Cimmerian, Solomon Kane, King Kull etc), whose stories were always full of brutal fighting and thunderous action. As I grew a little older, I then moved onto the so-called Men’s Action Books of the 1970’s, and devoured Don Pendleton’s early Mack Bolan series, Warren Murphy and Richard Sapir’s The Destroyer, and also the violent Peckinpah-inspired western’s of George G Gilman, notably his Edge and Adam Steele books. Looking back, the protagonists of all the books I was reading, and therefore trying to emulate in my writing featured tough guys with a heart, who had a certain set of morals that they would not shirk from. They were anti-heroes in one sense, vigilantes who weren’t afraid to take the law into their own hands in order to do what they perceived as the right thing. To some, their morals might be questionable – if not objectionable – but I’ve always asked myself to what lengths anyone would go to protect someone that they loved. When my reading tastes grew a little more ‘mature’ I of course sought out and fell in love with the crime genre, with all its many connotations and sub-genres, but in particular the American thriller, David Morrell and Dean Koontz being my favourite authors at the time. I am British, and for eighteen years worked in the private security industry, then for four years as a police officer in Cumbria. Some people are surprised that my books aren’t police procedurals, set in and around the UK, or that I am writing to my strength of experiences. But to be honest, I write what I like to read, and pitch more to the crime thriller than the whodunit. Crime is the nucleus behind the Joe Hunter thrillers, but there isn’t so much a mystery to be solved, as there is one to be overcome. Most British crime novels are cerebral, whereas I aim for visceral with my thrillers. I like the buzz of adrenalin in my chest that comes from a fast moving thriller, and if I don’t get a similar feeling when I’m at the keyboard, then the writing doesn’t flow. I like my writing to be cinematic, almost visual, and to allow the reader to picture the flow for him or herself…hopefully giving them a similar buzz. To allow Joe the scope for continuous action, and a series of diverse arenas to move through, I chose to send him off to the USA, still a land of mythic proportions in most readers’ minds. Hollywood and TV America is still a fantasy land where adventures as large as those Joe moves through can still happen, whereas I didn’t feel that the UK was big or diverse enough to contain them. Although I have set the Joe Hunter thrillers in the USA, I aimed to develop a truly British hero. I’m British, with a British mentality, and part of the fun for me is placing Joe into situations and places that are totally foreign and unusual to him. From this ‘Englishman abroad’ mentality, I’m showing the USA through Joe’s eyes, making for an interesting culture clash at times. Some of my readers – mainly Americans – haven’t picked up on this yet, and some find Joe to be a little arrogant: perhaps it’s true and they don’t get British irony and self-deprecation? (That was also a joke in case anyone missed it). To offset Joe’s Britishness, I’ve given him a friend and sidekick in Jared ‘Rink’ Rington. Rink is an anomaly in that he is part Japanese, part Scottish-Canadian, but all American. I enjoy the interplay between the two, from which comes the humour necessary to leaven some of the darker aspects of the books. Prior to writing Dead Men’s Dust, the first in the Joe Hunter series, I had written seven complete manuscripts, five of which were standalone crime thrillers, all of them unpublished. For twenty-two years I was sending the books off to agents and publishers alike, but was receiving the standard rejection slip that most aspiring authors are very familiar with. Along the way I had a few near misses: shortlisted in a national novel writing competition and having one publisher show interest in one book only to turn it down at the eleventh hour. However, these near misses told me that I had to be doing something right, but also something wrong. It won’t be the route to publication for everyone, but I took a step back and tried to figure out where I was going wrong, with an aim to rectifying the fault. I took a look at the big sellers in my genre – Lee Child, Robert Crais, Harlan Coben, John Connolly – and quickly realised that to get my foot in the door I had to come up with an ongoing series, following the same characters, and also in an international setting. This made me go back and look at my older work, and to be sure, they were all standalone with no scope for follow ups: ergo, they weren’t commercial or marketable. I realised that I needed to come up with a character that could carry a continuing series, who had the background, the skills and the opportunities to keep falling into life and death situations. As I said earlier, I didn’t want to write about a policeman or detective – others do it far better than I ever could – so I chose to make Joe Hunter a retired soldier. Comparison to Lee Child’s Jack Reacher is inevitable, but unlike Jack Reacher, who is a thinker and tactician, I wanted Joe Hunter to be more the go for broke kind of guy, who wings things by the seat of his pants, your typical squaddie in some respects. I also pulled from my old influences of Mac Bolan and Edge, and decided that Joe should be a throwback to those action men, knights in tarnished armour, the gunmen of the Wild West, or the lone wolf samurai who had a strict code that they were prepared to kill and die for. I also pulled on some of my earlier books, one a gothic fantasy featuring a sword wielding lawman, and another a private eye novel featuring characters not dissimilar to Joe and Rink. By amalgamating these influences, I then wrote Dead Men’s Dust and sent it off, alongside a plan for further books in the series. On the back of this I was able to snag an agent and the elusive publishing agreement I’d been aiming for. Dead Men’s Dust came out in 2009, and was acclaimed as a Daily Telegraph thriller of the year, and was also shortlisted for the International Thriller Writers’ Best New Novel Award. This was followed by Judgement and Wrath and then Slash and Burn. Each of the first three books is best defined as a chase thriller. Because Joe Hunter has a history, it was inevitable that it would impact on the current day and I investigated this somewhat in Cut and Run, the fourth book in the series, where unresolved business from his army days comes back to haunt him. The same could be said of the latest in the series, Blood and Ashes, but whereas Cut and Run featured old enemies, in this one Joe’s enemy comes in the shape of a force much closer to home. Brook Reynolds supposedly died in a car crash, but her father isn’t happy with the police’s findings and calls in Joe to find those responsible for her death. The problem is, they find Joe first, and he is pitched into a situation where he has to protect the remaining family members from termination, and along the way falls foul of a white supremacist plot to bring the American government to its knees. Behind the plotters are another group and their involvement is something that will resonate through further books in the series. is published by Hodder and Stoughton on 17th February 2011.